Yesterday, I went for the soft opening of Legoland Dubai. 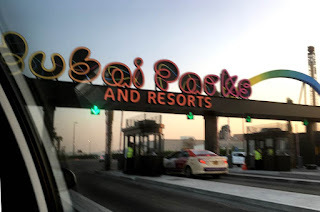 It's a much anticipated attraction at the Dubai Parks & Resorts - home also to the Bollywood Parks (I hear you can film your own movie here), MotionGate (a Hollywood inspired theme park), Lapita (a Polynesian, tribal themed Marriott hotel) and Riverland (retail and dining zone). Now who doesn't love Lego right? I remember spending as many hours building Lego house models as I did playing with Barbie! So when you get a free ticket for a trial run of the park, you go! This wasn't the first Legoland I have visited. On a trip to the U.K., we spent such a fantastic day at the Legoland. Imagine what a fascinating sight it was to my ten year old eyes! I vividly remember seeing a Lego version of a giant Cadbury chocolate bar. The miniature recreation of London in Lego has stayed in my mind. With no photos from that visit, it's only fading memories that I hang on to, and it all came flooding back when I walked in to Legoland Dubai last evening. Located opposite the Palm Jebel Ali, getting to Dubai Parks & Resorts is best possible if you're driving there. There's no metro connectivity and cabs are hard-to-find. It's quite a ride so stock up on some chips and water before you head away. Winter's the best time to visit so they're just about opening in time. Summer would mean sandstorms and closure of some rides. Tickets are priced around AED 200 per visit per head and annual passes are available too at a whopping two grand a pop. There's WiFi here, so don't worry about connectivity; enjoy, click and share your experience! So let's jump straight into it: the best part about Legoland Dubai is the indoor air-conditioned Miniland. Lego experts have painfully recreated Dubai and global attractions in a miniature format. The entire Sheikh Zayed Road with its glimmering towers, complete with moving traffic on the road was quite something to look at. The Burj Khalifa even here was an attraction - you can catch the wondrous spectacle of the Dubai Fountain here too. But the Dubai Creek and Desert with its belly dancing figures were fantastic. The level of detail is commendable; if you looked closely you'd even see little Lego figures selling their wares inside the souks. Oh and how could I forget the moving metro from station to station. I thought the mini metro moved faster than the real life one! Then there was also the heritage sites from Petra Jordan, the Taj Mahal from India and Sheikh Zayed Grand Mosque from Abu Dhabi, all majestically Lego-ed. Here are some pictures and videos from inside Miniland....enjoy! Spot the belly dancers in the desert! Looks like Emirates just took off! A street in Dubai...There's lots to see even when you take a peek into the shop windows! Recognize the Deira Clock Tower? I've been to the real Sheikh Zayed Grand Mosque in Abu Dhabi and this Lego version was just as beautiful! Egypt right here in Dubai! Even Shah Jahan would have been proud! Let's talk rides now - most of the rides were perfect for the kids. Apart from the roller coaster which was closed yesterday, the adults wouldn't get their adrenaline going here. But I am sure you would love spending time at the Play Table where you can build Lego figures just the way you like it! My guess is the Legoland Water Park once open would be enjoyable for the adults and kids alike (there's a catch here: additional entry fees required to the Water Park). Don't miss out on a selfie with the Lego man! While at Legoland, you won't be left hungry. There's around 12 options to choose from among restaurants, food stands and snacks. Dubai Parks and Resorts will see a phased opening. 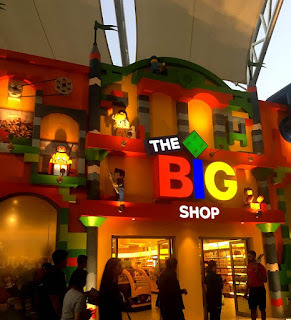 While Legoland Dubai and Riverland open on 31st October, Legoland Water Park and Bollywood Park opens 15th November and finally MotionGate on 16th December. Frankly, MotionGate looks exciting - think about it, movie characters and sets from the best movies from Lionsgate, Sony Pictures and Dreamworks will come alive here (think: Shrek and family! So much to see, so little time! Buy your passes now.